Calling all residents and businesses on Portland Road📢 . Help us brighten up Portland Road this Summer with flower filled pots, hanging baskets, window sills or gardens. Lets make Portland Road beautiful ! 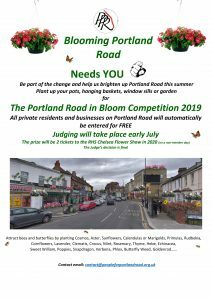 We are running a competition to find the best blooming display on Portland Road🌻🌻🌻. All private residents and businesses on Portland Road will automatically be entered for FREE. Judging will take place in early July 2019. If you live or work on Portland Road look out for the flyer that will be delivered soon. The prize is two tickets to the RHS Chelsea Flower Show in 2020 (on a non-member day). The judges decision will be final. Attract bees and butterflies by planting Cosmos, Aster, Sunflowers, Calendulas or Marigolds, Primulas, Rudbekia, Cornflowers, Lavender, Clematis, Crocus, Mint, Rosemary, Thyme, Hebe, Echinacea, Sweet William, Poppies, Snapdragon, Verbena, Phlox, Butterfly Weed, Goldenrod…………….